Fuyu Persimmons grown by DeLois Weathington. Recently my son showed me a picture of some produce a family friend had brought by his place of employment to share. Upon seeing the photograph, I remarked how pretty were her tomatoes. But, no, my son insisted. The pictured fruit was not a tomato. Not a tomato? Well, that was just absurd. It certainly looked like a tomato, and a ripe, pretty one at that. However, my son continued to insist it was not a tomato. Ok, then, wise guy, I countered, what do you call it? A persimmon, Mom. Persimmon? Well, we grow those things that turn your mouth inside out right out back in our horse pasture, but I can assure you, mine look nothing like these. Having to know how these persimmons seemed to have morphed into a tomato, I decided to go right to the source – Mrs. Lourie Hammond. However, Miss Lourie said she was not the grower of this strange fruit; only the sharer. She, however, pointed to the source of the fruit confusion – Mrs. DeLois Weathington. Mrs. Weathington, wife of Ebbie (whom many may know as having grown up on the Westside many years ago), is originally from Florida. She said it was there she first came in contact with these monster persimmons when her father, who worked in a nursery, budded one. While Mrs. Weathington says she can graft but not bud, she picked up her current persimmon trees at the flea market in Augusta some years ago. Now, Mrs. Weathington has become somewhat of a persimmon ambassador and hopes interest in this larger type will spur its cultivation in our area. Called Fuyu Persimmons, these giant persimmons sure can fool you. Everyone who saw these persimmons while they were on display at The Advertiser offices thought they were tomatoes. One woman proclaimed she had been on this earth a long time and had never seen such in her life. 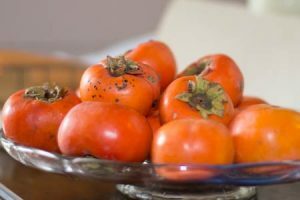 Being accustomed to the wild persimmons grown in these parts, Mrs. Weathington says the Fuyu, a cultivated Japanese persimmon, is not nearly as tart. In fact, she eats them like an apple. However, Mrs. Weathington did say if you wait to eat them until they have gotten soft, they will be extremely sweet. Being an ever diligent reporter, I knew I could not properly write this article without having some first hand knowledge of the taste of this interesting fruit. However, being the good mother that I am, I let my daughter try it first. She made a few strange faces and pronounced the taste was not for her. Remembering this is also the child that has a fondness for sweet grass, I decided to give it a taste myself, and I must confess – I liked it! However, it truly has a taste all its own. I could think of no other fruit with which to liken it although its texture is somewhat like that of a hard peach. However, this did not take away from the taste, and I am glad Mrs. Weathington insisted I take a few because I intend on eating them all. Now, I do not want to sound greedy when I say that. It is just most country folks know the fun of offering a wild persimmon to unsuspecting city friends who have not had the pleasure of having their eyeballs roll back in their heads as their tongues try to escape their mouths after eating a local persimmon. And, as I have only recently given a dear friend such an initiation into country life, I doubt I will be able to find anyone willing to share this fruit with me. In fact, I did actually try to share one of my persimmons with some family friends. A tomato, they exclaimed as I held it out for them. However, as soon as I told them it was a persimmon, they both gave me that I’m-not-falling-for-that-trick-look and politely stowed it away. Oh well, you can’t say I didn’t try. It sure it a shame, though, that these delicious persimmons will have to fight the prejudice their wild cousins have produced against them. I encourage you – be brave, be bold. Give the Fuyu persimmon a try. You’ll be glad you did. One Response to "It’s a What? No, It Is Not a Tomato"
I totally agreed the persimmon are wonderful fruit. It reminded me of one of our fruit we have back home, it is call neaseberry. I love just bought a case for friends and family and they all love it.